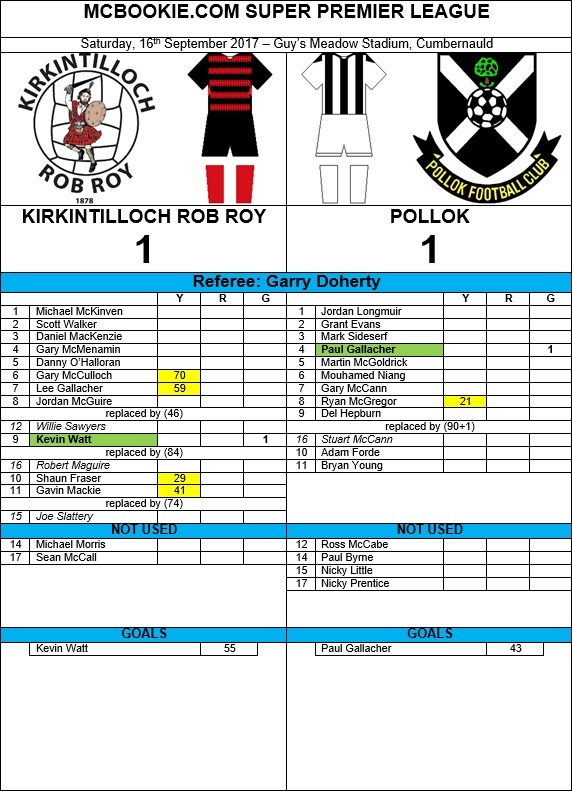 Pollok made it three unbeaten league games in a row after a 1-1 draw with Kirkintilloch Rob Roy at the latter named’s temporary home of Guys Meadow Stadium. Del Hepburn was first to threaten for ‘Lok with a brace of sighters, neither of which troubled Michael McKinven in the Rob Roy goal. His strike partner Adam Forde was up next after a counter-attack from a Rabs’ corner. The former Kilbirnie man lost his footing and was unable to generate enough power to beat McKinven. Forde then came close when his free-kick grazed the outside of the upright before Kirkintilloch had their best chance of the half, Lee Gallacher firing wide from the edge of the penalty area. 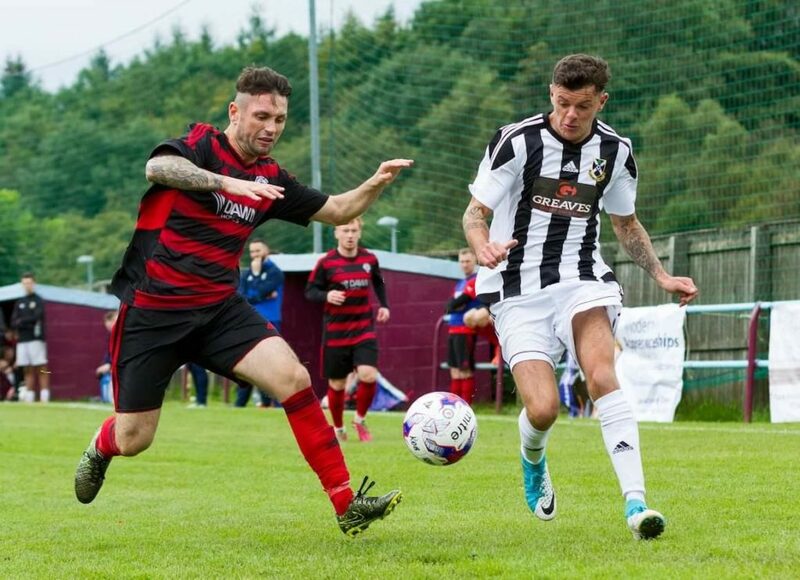 The visitors’ took the lead in the 43rd minute, Bryan Young’s corner was met by skipper Paul Gallacher to bullet a header home, despite the best efforts of the Rob Roy defender on the line. The opening effort of the second period saw the MacGregor’s restore parity. A long pass by Daniel Mackenzie over the top of the Pollok rearguard found Kevin Watt, who beat the advancing Jordan Longmuir to the ball and find the net with a deft finish. Pollok almost restored their lead immediately, but Gary McCann was denied by a superb fingertip save from McKinven. Rob Roy then entered into their best spell of the game, Watt failing to find his second of the game when he dragged the ball past the post. Willie Sawyers then had a shot diverted wide for a corner before Gary McCulloch fired down Longmuir’s throat from 20 yards. Sawyers pounced on a short passback to cut the ball back, Watt letting it run through his leg’s to Shaun Fraser. Fortunately for those of a Pollok persuasion his connection wasn’t the cleanest, allowing Longmuir to gather safely. ‘Lok’s best chance in the dying embers fell to Hepburn, who fluffed his lines after Forde had flicked Longmuir’s goal kick his way. The final goalmouth action saw Longmuir beat a Gallacher drive into the path of Robert Maguire at the edge of the area, alas his shot was something of the daisy cutting variety.